Hello, My Name is Chris and I'm a Runaholic: A Monumental mess?? All Sport Central bought the Mt. 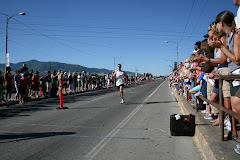 Rushmore Marathon from the Rapid City (SD) Convention and Visitors Bureau a few years ago after the city determined it was too time consuming to put on a marathon. The first major change ASC made was to move the course from it's location of 30+ years so that it actually went past Mt. Rushmore (the original course wasn't within 20 miles of the memorial). This was an unpopular move from the start because the original course had been a fast downhill one that was PR and BQ friendly. 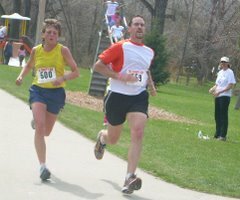 The first year under ASC, the marathon started at Mt. Rushmore, went down to Hill City and then up to the Crazy Horse memorial. That final stretch up to Crazy Horse was a brutal 8 mile climb and people hated it. 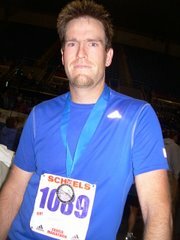 So, last year ASC came up with the bright idea to have not one, but two marathons, one starting at Mt. Rushmore and one at Crazy Horse with both ending in downtown Hill City. ASC seemed happy and proud of this format, it went remarkably smoothly I'll admit, and the plan for this year was to repeat this double-marathon strategy. Apparently not everyone was so keen on the idea though. In order to do anything besides look at Mt. Rushmore, you need a permit. ASC had gotten into the habit of waiting until the last minute to obtain said permit and this year Mt. Rushmore said "enough of this crap, come back next year and do this on time" (I made that up, but it's the gist of what happened as far as I know). Also, Hill City citizens were disgruntled with the closed roads around town that made them late for church last year, so the city wasn't too keen on granting the necessary permission either. So, what to do? Well, how about combining two marathons, totally rerouting the course, and changing the name of the whole thing? Sounds like a plan. 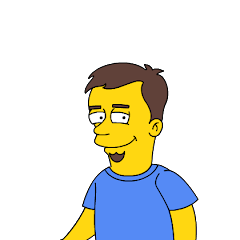 Oh, and let's wait until 10 days before the race to announce all of this! That's right, I got an email on Thursday night with the news of the demise of Crazy Horse/Mt. Rushmore and the rise of Monumental Challenge from their ashes. I'm going on record as saying that the new name is lame. 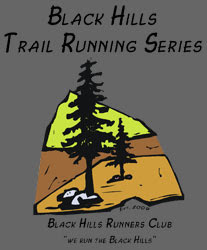 I'd much prefer "Black Hills Marathon" but, obviously, no one asked me (for some reason). ASC stated that they would offer "registration transfers" to anyone who wished to skip this year's event and come back next year (when the two-marathon thing will supposedly happen again). 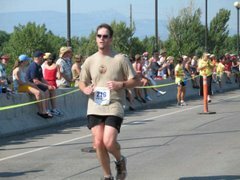 The chief organizer of the event has stated that he wants to make this a "goal marathon" and attract 5,000 to 15,000 runners each year. Not bloody likely if you continue to commit organizational blunders like this. Having said all of that I, for one, am in this for better or for worse for two reasons. The first is that Crazy Horse wasn't a goal marathon for me, just something to do for the fun of it that's close to home, and that hasn't changed. The second is that, in my opinion, the new course is MUCH better than either of the old ones. 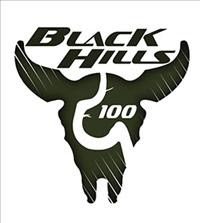 The race will now be run almost exclusively on the Mickelson Trail, which is a crushed gravel path that extends a total of 110 miles across the Black Hills from north to south. It was an old railroad until the 90s, and while there are ups and downs, the grades are very gentle. We'll start just west of Rochford (which consists of a bar, a post office and a community center) and finish in Hill City. It's a point to point course, so no doubling back and covering the same terrain twice like there was last year. The first 10 miles or so are a gentle downhill, followed by 8 miles of gentle uphill, followed by another 8 miles of gentle downhill. I wonder, after running the event on this course, if anyone who matters (i.e. the runners) will actually want to go back to the dual courses? I'm sure some will, but my guess is that far more would choose the new Mickelson course. So what if you don't get to see Mt. Rushmore or Crazy Horse during the race....as if you're really paying attention to some mountain carvings when you're about to run a marathon anyhow. Anyhow, this Sunday will be interesting for sure. Hopefully, ASC manages to get all of their ducks in a row and can pull this thing off despite all of their own self-generated problems. I'm kind of hoping everything goes perfectly and they decide to adopt the new course for good....as long as they change the name. Very interesting. I wish you the best of luck on the new course.